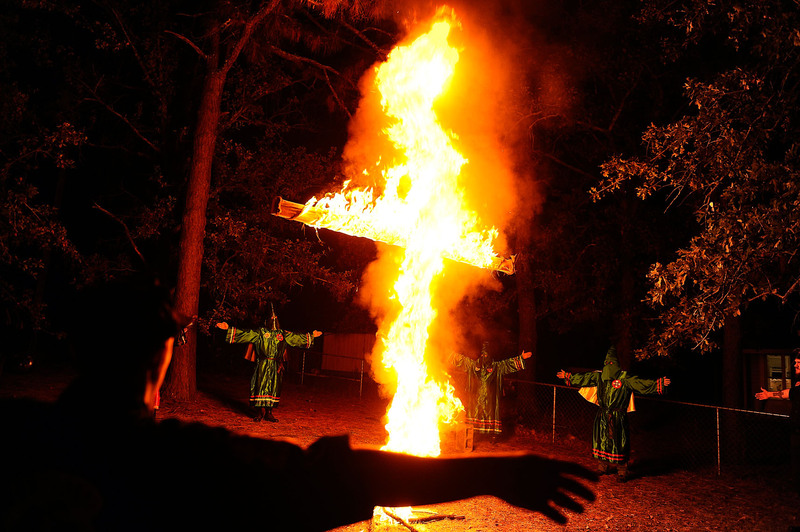 Members of the Ku Klux Klan watch a cross burn Saturday, Oct. 23, 2010 in Warrenville, S.C. Duwayne Johnson was initiated as the Imperial Wizard of the All American Invisible Knights and announced his group would soon have a larger presence in Augusta, Ga. That day about 20 Klansman protested for white rights, against illegal immigration and the Keaton case (a Christian student who was ordered to council gays but refused) outside ASU. Johnson claims his chapter is not about white supremacy but about keeping races separate in "relations" (i.e. mixing seed). He says he's trying to show that this new breed of Klan is more forward thinking and the history they carry from the 50's and 60's is no longer. According to Johnson, the cross lighting is a ceremonial ritual as a sign of purification not disrespect to the Christian symbol. The cross is wrapped in burlap, doused in kerosene and lit for about 10-15 minutes. After the ceremony, it is put out with water. This was the first Augusta area public cross lighting ceremony in about 50 years. It also was one of the first open for a female African-American to witness without opposition.